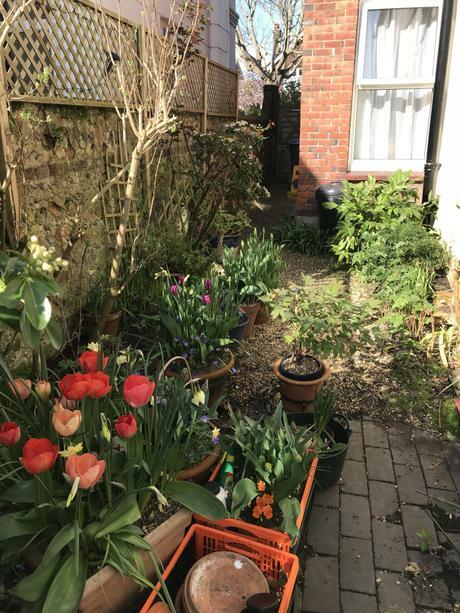 I moved to Worthing in February 2001, seventeen years ago after buying a large ground floor flat in a Victorian conversion. 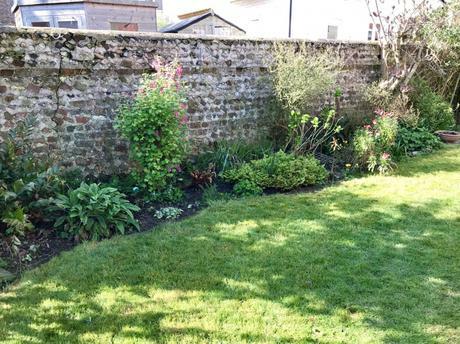 I bought it because it had its own rear garden, albeit overgrown with ivy, not only over all the stone walls but through the borders and lawn. 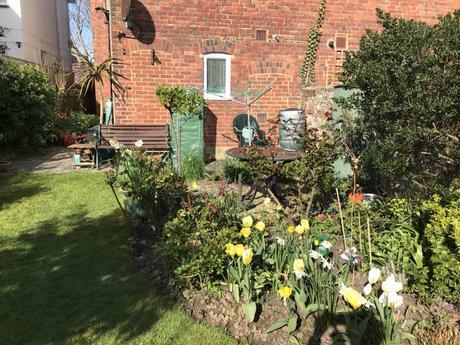 I lovingly restored it, turning it into a good old-fashioned English cottage garden, with lots of roses and flowering shrubs. We are, at last, blessed with sunny, warm weather which is about time. Last week the lawn was a boggy mess with standing water in the borders. It has only taken four sunny days to dry out and buds are appearing everywhere. 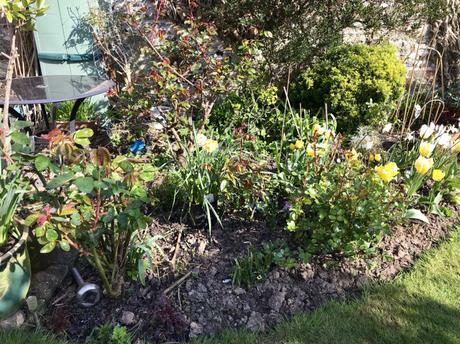 Last year the above border was packed with yellow and white tulips and daffodils. I left the bulbs in rather than dig them up and the display is not as good this time round. 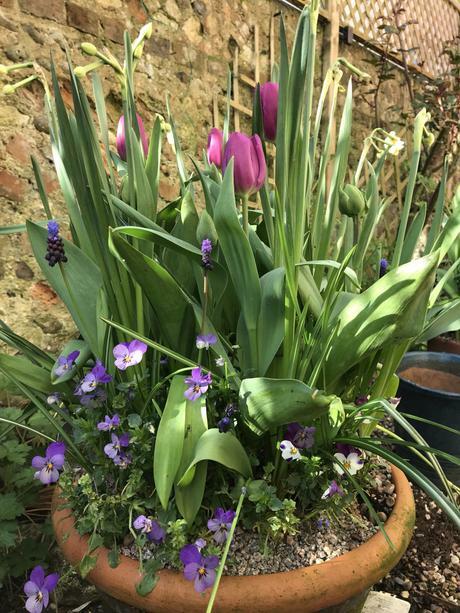 I think this is a lesson that it is worth removing spring bulbs after flowering. I was a bit heavy handed pruning the Ribes so this year it is not as spectacular as in previous years. The Astilbe has shoot up in a week, and really should have been thinned out. All the tulips are coming into flower and are going to make a colourful show. Strangely a number of labels are missing, I know I was really careful labelling everything when planting up. I am moving on Friday (20th) and leaving all of this behind, except for my pots. A lot have already been distributed around family and friends and the others I will take with me. The above pot is one of five coming to my new home. I am moving to Emsworth a small harbor town on the south coast near Chichester. 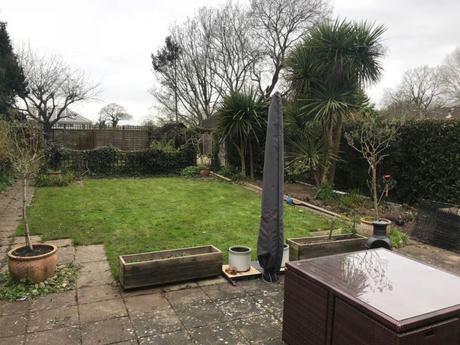 Throughout life we learn to make compromises and here is my compromise – my new home has south facing French doors and a patio, but NO GARDEN. Paying off an interest only mortgage left me with a limited budget. 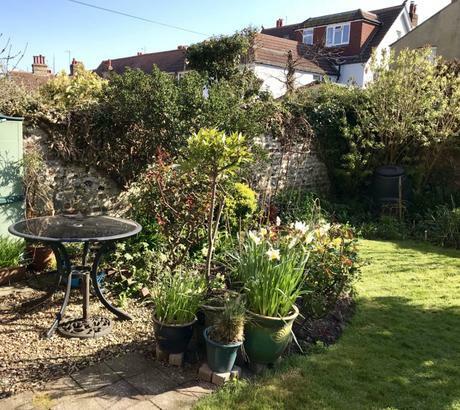 I had looked at the Isle of Wight where I could afford a property with a garden, but when the Emsworth flat came up, moving to the IoW weighed up against being in easy reach of friends and family there was no contest. All is not lost though. My youngest daughter and her husband recently also moved to Emsworth. I’ve blogged recently about their garden which they are happy for me to work in, (it gives them a free gardener!!). The garden is a renovation project and already beginning to take shape. There will be a lot to blog about. 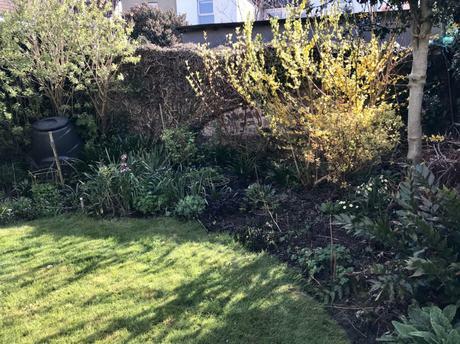 I do feel sad about leaving my much loved garden, especially as I’ve discovered my buyer is going to rent out the flat. I can only hope someone who loves gardening will move in, but it is something I can’t dwell on once I’ve locked the door and waved goodbye. Onwards and upwards to new horizons. Oh, I almost forgot, I’m in negotiations to share an allotment which really is exciting. So with that and my daughter’s garden I will have plenty to keep me busy.